We got one the train in Moscow and I fell asleep almost instantly. On every other train we’ve taken, the train attendant carefully scrutinized our passports before allowing us aboard, verifying our names there with the names on our tickets. This time, the train attendant didn’t even open our passports. She didn’t glance at our visas to ensure that we were entering Belarus legally. (And believe me there was no question we were Americans.) She just glanced at our tickets and waved us on the train. We knew there was a three hour stop around 1:00 AM, and I assumed that would be the border-crossing, and that I’d be woken up to deal with officialdom. This is what happened when we crossed the border from Mongolia into Russia, after all. But when the stop came, no one knocked on our door, and I slept through till morning. 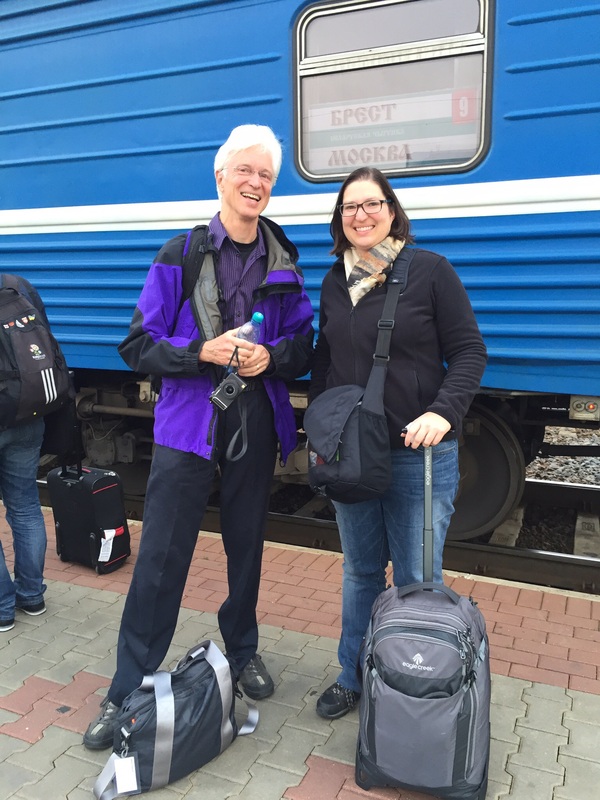 Steve and Carrie arrive in Minsk. How’s that for traveling light? So here I am in Minsk, with no Russian exit stamp in my passport, and no Belarusian entry. But I do have a visa (that was a bit difficult to get, actually) saying I’m allowed to be here right now. Steve assures me that he’s triple checked, and it’s not a problem. I just need to make sure I have my train ticket handy to show that I entered the country during the validity period of my visa, and all will be fine. In the meantime, I am here in Minsk for two days, enjoying the hospitality of Steve and Alla, and being shown around a city that I’ve heard much about. More on Minsk later….